If it opens in your browser as a sound file, just right-click and hit “Save As..”, or whatever the equivalent might be on your system. This is a bit unusual for this site, but I decided to create a ringtone from a brief clip of audio on The Ricky Gervais Show. I figured I’d share it, in case anyone else wanted this kind of nonsense in their lives. 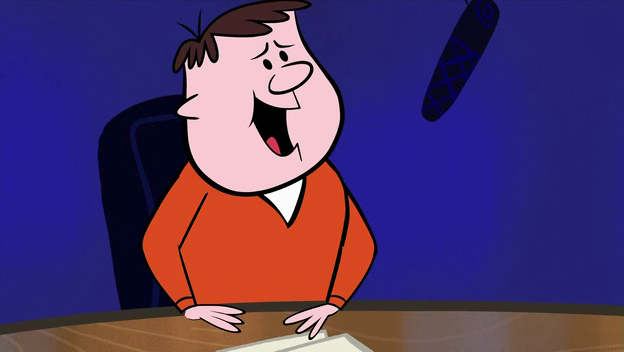 In the episode, Mr. K. Dilkington argues that every noise has been used at least five times. He then goes on to ask why things can’t be made to make a different noise to the ones they make. Ricky insists that things make a noise because the noise is a byproduct of function, and that “they” don’t pick the noise. He gives the example of Stephenson’s Rocket making the noise of a steam engine, rather than someone having asked Stephenson to make it go “yememememememeh yememememememeh yememememememeh“. In accordance with the wishes of Karl Pilkington, I have used this noise at least five times in the MP3. If you want to look back on it, this was from Season 2, Episode 11 (“Mrs. Battersby”), with the relevant segment starting at 19:40. I’m pretty sure this would be considered to be fair use. I’m not making a dime on this, and if anyone (other than Gervais / HBO) tries to sell this to you then they’re probably full of crap. Tagged Karl Pilkington, Ricky Gervais, ringtone.